I am a Professional Singer/Entertainer and have worked with many of the top musicians in Toronto mostly for many years. Please see the "About Us" button and scroll down to Barbie's Resume and click on it for some of my achievements. I now do a duo show at Retirement homes & Senior Centers with my pianist Tracy..."Just the 2 of Us". Voice lessons are specialized for Singers, Actors and Public Speakers to learn to "project" their voices through breathing control and use of their lips. Microphone technique is also taught and singers learn to give feeling to their songs. I teach private and semi private lessons to all ages over 7 years of age who want to be in Theater or Performing. Songs are taught after the first 5 weeks, when you have some knowledge of the techniques for breathing and "placing" the voice. Serious students only. As a vocalist I am available for your Pub night/day show, retirement home shows, your Wedding day and more. 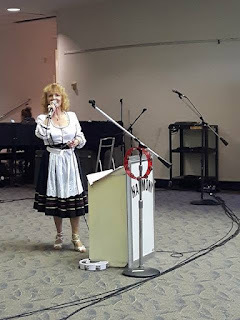 I have a Professional keyboard player, who backs me for middle of the road songs, some contemporary songs as well as Country,Latin &/or sing along. As well my husband does D.J. work for Ballroom/Latin/social dancers. Please contact me for more information on booking a show for your event or to book your first lesson!